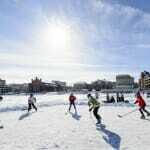 Temperatures in Madison rivaled those in Antarctica on Wednesday and Thursday, prompting the city to all but shutter its doors. 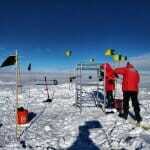 But for researchers at UW–Madison’s IceCube project, an enormous particle telescope built in the ice beneath the South Pole, it was just another day at the office. 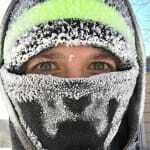 “We always want what we can’t have — and for months, we’ve wanted sunshine and warm weather. 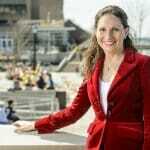 Now that we have it, though, there’s a bit of pressure to enjoy every moment,” says Christine Whelan. 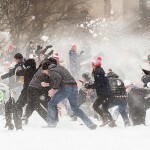 The hill that's hosted an igloo and snowmen this winter was taken over Wednesday by snowball-hurling students. Sun, snow and ice created the perfect setting for the annual winter celebration. 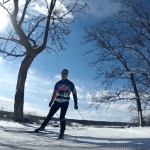 UW-Madison students and members of the community celebrated the season at the Hoofers Winter Carnival Saturday. 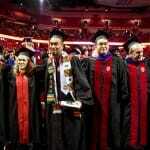 More than 1,000 students celebrated winter commencement Sunday at the Kohl Center. 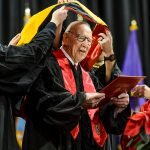 Astronaut James Lovell delivered the charge to the graduates. 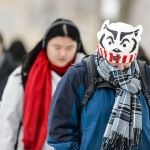 A student keeps warm in her Badger hat as she walks along Linden Drive at the University of Wisconsin–Madison during a class change on Jan. Living along the jet stream – those fast-flowing air currents in the upper atmosphere circling the earth – brings its share of erratic weather patterns and unpredictability. 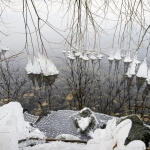 Professors Jonathan Pauli and Benjamin Zuckerberg explain the subnivium — habitat between the ground and winter snow cover that is being affected by climate change. 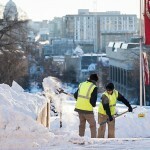 Hardworking grounds crew members shovel snow and clear the steps to the Lincoln Terrace near Bascom Hall during an early winter morning on Monday, Feb. 2. 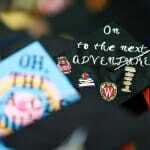 In the background on Bascom Hill hang banners featuring the university’s W crest. 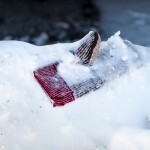 A lost mitten awaits its owner in a snow bank near UW–Madison’s Walnut Street Greenhouse during a subzero winter day on Wednesday, Jan. While many Badgers have left campus for winter break, a lone woman rides her longboard alongside a partially frozen Lake Mendota. 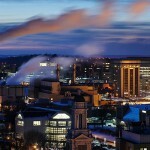 These photos depict views of the western, urban part of campus from the roof of the Engineering Research Building.